In the field of pharmacology, an inverse agonist is an agent that binds to the same receptor as an agonist but induces a pharmacological response opposite to that agonist. A neutral antagonist has no activity in the absence of an agonist or inverse agonist but can block the activity of either. Inverse agonists have opposite actions to those of agonists but the effects of both of these can be blocked by antagonists. A prerequisite for an inverse agonist response is that the receptor must have a constitutive (also known as intrinsic or basal) level of activity in the absence of any ligand. 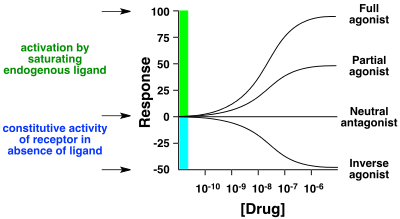 An agonist increases the activity of a receptor above its basal level, whereas an inverse agonist decreases the activity below the basal level. The efficacy of a full agonist is by definition 100%, a neutral antagonist has 0% efficacy, and an inverse agonist has < 0% (i.e., negative) efficacy. Receptors which inverse agonists have been identified for include the GABAA, melanocortin receptors, mu opioid receptors, histamine receptors and beta adrenoceptors. An example of a receptor site that possesses basal activity and for which inverse agonists have been identified is the GABAa receptors. Agonists for GABAsub-unit receptors (such as Honokiol) create a relaxant effect, whereas inverse agonists have agitation effects (for example, Ro15-4513) or even convulsive and anxiogenic effects (certain beta-carbolines). Two known endogenous inverse agonists are the Agouti-related peptide (AgRP) and its associated peptide Agouti signalling peptide (ASIP). Both appear naturally in humans, and each binds melanocortin receptors 4 and 1 (Mc4R and Mc1R), respectively, with nanomolar affinities. The opioid antagonists naloxone and naltrexone are also partial inverse agonists at mu opioid receptors. Nearly all antihistamines acting at H1 receptors and H2 receptors have been shown to be inverse agonists. The beta blockers carvedilol and bucindolol have been shown to be low level inverse agonists at beta adrenoceptors. ^ Kenakin T (April 2004). “Principles: receptor theory in pharmacology”. Trends in Pharmacological Sciences. 25 (4): 186–92. doi:10.1016/j.tips.2004.02.012. PMID 15063082. ^ Nutt D, Stahl S, Blier P, Drago F, Zohar J, Wilson S (January 2017). “Inverse agonists – What do they mean for psychiatry?”. European Neuropsychopharmacology. 27 (1): 87–90. doi:10.1016/j.euroneuro.2016.11.013. hdl:10044/1/43624. PMID 27955830. ^ Mehta AK, Ticku MK (August 1988). “Ethanol potentiation of GABAergic transmission in cultured spinal cord neurons involves gamma-aminobutyric acid voltage-gated chloride channels”. The Journal of Pharmacology and Experimental Therapeutics. 246 (2): 558–64. PMID 2457076. ^ Sieghart W (January 1994). “Pharmacology of benzodiazepine receptors: an update”. Journal of Psychiatry & Neuroscience. 19 (1): 24–9. PMC 1188559. PMID 8148363. ^ Ollmann MM, Lamoreux ML, Wilson BD, Barsh GS (February 1998). “Interaction of Agouti protein with the melanocortin 1 receptor in vitro and in vivo”. Genes & Development. 12 (3): 316–30. doi:10.1101/gad.12.3.316. PMC 316484. PMID 9450927. Khilnani G, Khilnani AK (September 2011). “Inverse agonism and its therapeutic significance”. Indian Journal of Pharmacology. 43 (5): 492–501. doi:10.4103/0253-7613.84947. PMC 3195115. PMID 22021988. Jeffries WB (1999-02-17). “Inverse Agonists for Medical Students”. Office of Medical Education – Courses – IDC 105 Principles of Pharmacology. Creighton University School of Medicine – Department of Pharmacology. Retrieved 2008-08-12.